Watercourses. Gutter system. All types of drainage systems: metal, plastic, PVC. Producers: Hunter, Plastmo, Profil, Ruukki. Installation of drainage systems. Prices drains. Kiev. необходима практически на любой кровле. Drain system is needed on virtually any roof. Drain system protects the outer walls and basement from water, the foundation - from excessive moisture. Thanks drains water from the roof is collected in gutters and is discharged through the pipes, in this case the building is not at risk of premature failure. Modern drainage systems have a full integration of all necessary elements, including fasteners. The shape of gutters and pipes can be circular and rectangular. Application of any type of gutter system is determined by aesthetic perception overall architecture of the building and selected an architect or building owner. At the same time ready to drain the system does not spoil the look of the building, but on the contrary, gutters attached house some finality, emphasizes the transition from the roof to the walls of the gable to the front. This house will look stylish and elegant. The most common materials for gutters - galvanized steel with polymer coating, usually two-sided plastisol 100 mm, PVC and copper. Each of these materials has several advantages for their organizations divert water from the roof. Before installing the gutters need to think about what material they will be executed, and downpipes which forms and colors to choose. The shape and color of drainage system must be matched to the roofing, as well as well with the facade. The choice of material is an issue of personal taste, and, of course, finances. Gutter system can be made of steel (galvanized or coated), aluminum, titanium, zinc, copper or PVC. Each of these materials has its own characteristics (ie, the advantages and disadvantages) and the price that is taken into account when choosing a gutter in the first place. Metal gutter systems are protected by special coating of the Puranas, polyester, plastisol, or lacquered shell, which contain no chemicals and is absolutely harmless to humans and the environment, and by which the stability of these troughs to weather, mechanical damage, corrosion and fading increases. Moreover, such shells longer retain and enhance the color of gutters. Steel gutters are assembled using connectors with special rubber gaskets. Available in many colors, so they can easily pick the color of your roof gutters покрытия.Продолжительность service of steel - about 50 years. 6. 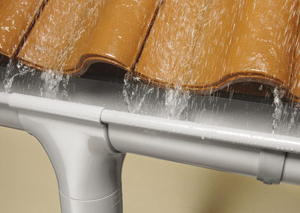 Some manufacturers of plastic drainage systems allow them ready gutters non-standard angles. This provides an opportunity to organize drainage systems on the houses with bay windows.